Remembering the face of a loved one isn’t confined to looking at old pictures of videos anymore. A new cremation solution has come about that truly lets you remember the face of a loved one. In fact, it allows you to remember their entire head. A company named Cremation Solutions has come out with a new product, entirely changing the way we remember the deceased. Their product is an urn that is entirely sculpted in the shape of the deceased person’s head. It is designed to match every characteristic of the person from the color of their eyes to the placement of their wrinkles. It actually looks like their head had been severed and mounted. It is a physical recreation of an entire head. They can recreate just about any person’s head. Whether that be the deceased person’s, the President’s or even Superman’s is entirely up to the person planning the service. These urns are made with a combination between art and the latest technology in 3-D imaging available. All that is required of the person requesting creation of the urn is a photograph. The company does note that they prefer at least two pictures, one being taken from the front of the person’s head and another from the side of the person’s head. However, the more photographs provided to the company from varying angles, the better the product will resemble that particular person. Each hybrid is made from an extremely tough polymere compound and once the product is completed, it is then mounted onto a solid marble base. The ashes are then loaded through the bottom of the base into the urn itself. These urns are made to represent the person of your choice, recreating every detail of that person’s featured. Every shape of each part of that person’s head is recreated digitally, the only exception being with the hair. Typically the hair is digitally added onto the urns. However, if someone has longer hair, the company will put a wig on the urn. These urns also offer nameplates, which are made from solid brass. Also, these urns come in two different sizes. One size, the keepsake size, stand 6 inches tall and holds a portion of the cremated remains. This urn costs $600. The second size, the full sized urn, stands 11 inches tall and holds all of the ashes. This urn costs $2,600. Once all of the details are decided, the company sends proof of the urn to the person requesting its creation for their comments and approval. Once approval is given, the process of creating the urn begins. The urn is made in the United States and typically takes in between two weeks to create. These urns are truly one of a kind. The company claims that no two urns are the same. They are the first to offer this service to the public. With this product, you truly never have to forget the face of a loved one. As we know, death is part of our existence and culture as is the way we dispose of the deceased. While cremation has been apart of certain cultures for years, it wasn’t accepted in America until very recently. The traditional practice of cremation has recently, within the past two hundred years, become accepted in the United States. It is now generally viewed as the more economically and ecologically favorable method for the disposal of the deceased. However, one biologist was skeptical of that supposed eco-friendliness and decided to create something “better”. The promession process basically consists of freeze-drying a body and reducing it to small granules. This process is claimed to be the most environmentally friendly method for disposition yet. It was created by and patented by a Swedish biologist named Susanne Wiigh-Mäsak, who has had a fascination with science and gardening since she was very young. She became extremely interested in composting and was shocked when she realized that the traditional method for burial was not as eco-friendly as once believed. Traditional burial methods entail placing a deceased body into a casket, and placing it a certain depth underground. This method has been claimed to return nutrients and minerals from the body back into the Earth. Wiigh-Masak claims that in order for something to properly compost and return nutrients back to the earth requires proper decomposition. Proper decomposition requires the same conditions that sustain life, including appropriate moisture and temperature levels. This is vital in returning nutrients back to the earth that can replenish the soil because those conditions allow the substance to properly break down to the appropriate nutrient level. Wiigh-Masak claims that those conditions are lacking in traditional burial methods. She says that in traditional burial methods, the body begins to rot rather than properly compost. This means that all of the body’s nutrients and other substances are returned to the earth, but they are not returned in the proper form that will allow the nutrients to enrich and replenish the soil. Wiigh-Masak set out to find a method that would. Promession is claimed to be environmentally friendly because the process returns nutrients from the body back to the earth, through proper compost. The process entails 6 steps. First, the body is frozen to -18 Celsius through a basic mechanical freezer. This can take anywhere from two days to one week. Once the body reaches the desired temperature, it is placed into a coffin and then lowered into a pool of liquid nitrogen. This is designed to cool the body down to -196 Celsius in order to make the body very brittle, firm and stiff. Once the body and coffin have reached the desired temperature, they both are exposed to a specific amplitude of vibration and light. This transforms both the casket and body into an organic white powder, which are the remains. Next, the powder is moved into a vacuum chamber. In this chamber, all moisture and water is evaporated cleanly and dispersed into the atmosphere as clean, natural steam. The dry powder then passes through a series of electrical currents that are designed to remove all metals, including mercury, from the powder. The extracted metals are then placed in special containers and sent to be recycled properly. What is left is a dry powder residue that will typically weigh about 1/3 of the person’s original weight. This dry powder mixture is then placed into a biodegradable container, typically made from maize or potato starch. This “coffin” is placed shallowly, approximately ½ a meter deep, underground and buried. It is suggested that a plant or tree is planted by the burial site. This allows those nutrients to be taken up by the plant. This creates an urn in a way by storing the nutrients from the body in the plant or tree. Typically, in 6-12 months time, all of the remains and the coffin itself will be decomposed properly, returning all nutrients back to the earth, which will replenish and nourish the soil. Currently, the practice is waiting for legal permission to proceed. Promessa currently has 12 bodies waiting in the freezing room. While legality is waiting in Sweden and Scotland, it is still entirely illegal in all other parts of the United Kingdom. There are many organizations looking to change the legality of the process. Prolifera is a non-profit organization looking for people to join in order to show their belief in the right to choose their method for disposition. However, there are some parts of the world that do permit the practice. South Korea has apparently ordered many Promator Units, the machinery used in the Promession process, according to Promessa UK. In the United States, the practice is currently illegal. Out of all the things you can read about on the Internet, prepare yourself to read some of the strangest, wackiest and interesting options for cremation. At one point, the practice of cremation itself was seen as crazy and wild. Nowadays, its popularity is rising and it is becoming part of our culture. Because of that, the definition of wild has been changed. Here are 5 wild things you can do with the ashes of a loved one that are all truly memorable. 1) Baby, you’re a firework! Literally…. We’re not just talking about a Katy Perry song here. Your loved one can be actually made into a firework. A portion of your loved one’s ashes is placed into the mixture of specially modified fireworks. Some services carry you out onto a boat and conduct an entire funeral service. After, the family of the deceased can watch their loved one’s remains scatter in color, and fall into the ocean. Some offer a few options including spectacular firework displays and even simple self-fired rockets that can be shot off at home. 2) Need a pencil? Here’s grandma! Your loved one can be made into pencils. An artist named Nadine Jarvis is the product designer for this idea. He has created a way to turn a loved one into pencils, around 240 to give you an idea. These pencils would be stamped with the deceased person’s name and their birth date and death date. They are created from the carbon left in the remains of a cremated body. 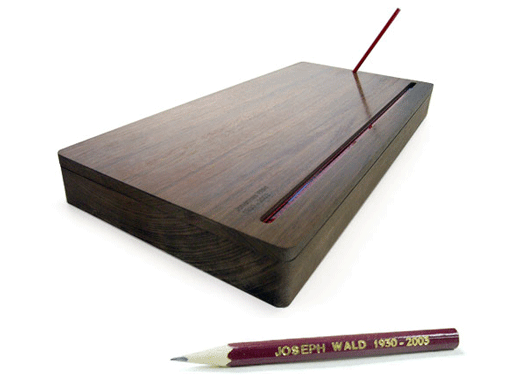 Once the pencils are created, they are placed into a box. This box includes its own sharpener and a dispenser that only allows you to use one pencil at a time. There is also a window on the edge of the box that lets you view the inside to see how many pencils are left. The pencil shavings from sharpening the pencil are stored in the box, occupying the pencil’s previous home. Because the shavings include the remains of the body, eventually the shavings fill up the entire box, transforming it into an urn. 3) I love you to the moon and back! You can shoot your loved one out into outer-space. This process can be as inexpensive as $650 and as expensive as $13,000. The pricing all depends on what kind of service you choose and the amount of remains sent up to space. The basic process of launching your loved ones ashes to space begins with placing a portion of those ashes into a sealed flight container. Next, the container is placed on an aircraft. Some companies have their own aircraft’s while other companies tag along other commercial flights. The least expensive services carry your loved one into space, orbit the moon and then bring them back down to earth. Other services take your loved ones remains into space and place them into orbit. Whether that is Earth’s orbit or the moon’s orbit is entirely up to you. The remains could stay in orbit from 10-240 years. Some services have future plans to launch cremated remains into deep space, passing our solar system. 4) Sparky the trusty dog never has to leave. Now, the remains of your puppy or loved one can be made into a stuffed animal. This option is very popular among pet lovers who just don’t want to say goodbye, but don’t really want to have their puppy stuffed either. For a deceased puppy, a stuffed puppy could be made to house its ashes. The same rule of thumb applies to just about any animal whether that is a cat, rabbit or hamster. This method can also be used for a family member. Depending on what type of stuffed animal you choose, you can have up to one cup of the remains put inside of the stuffed animal. The process begins by shipping the remains of the deceased to the service chosen. They then combine the remains with certain substances (this varies by service) and place them into a permanently sealed container, so that there isn’t any chance of spillage or leakage. It is then imbedded into the stuffed animal and shipped back to you. 5) Hang me up to dry! There are services offering portrait productions for your loved one. They offer hand painted portraits, in which the paint is made from the remains of your loved one. Some services offer to sketch your loved one, in which the ashes are scattered on paper and kept in place by a strong layer of glaze. This portrait can be of anything from a picture of your loved one, a family picture or a picture of a special place. It can be anything you want it to be, whether you want a sketch of a photograph or an entirely fantasized portrait. Some services offer digitally created pictures, meaning computer-made versus handmade portraits. The price for something like that could be as little as 100 dollars. You mail the remains of your loved one to the service you choose and once finished, they send back your portrait. Laying the deceased to their final rest isn’t so final anymore in South Korea. In 2000, South Korea passed a law saying that any deceased person buried in any year after 2000 was to be dug up 60 years after their burial date. This was because available land to house the dead in the small, highly populated area was simply running out. What was to be done with the deceased body after that? The body was to be disposed of through cremation. Around the year 2000, a new form of cremation came about. They are called death beads. The remains of a loved one were no longer confined to being stored as ash. Remains of a loved one could now be turned into beads. These beads aren’t the typical beads used to create jewelry or clothing. They create a modern gravesite, typically placed in glassworks on display for loved ones. The process is very similar to cremation, following similar heating strategies, yet it goes a couple steps further. The deceased body is heated in a compressed machine until all that is left ashes, almost identical to traditional cremation processes. Unlike traditional cremation processes, the ashes are then further heated. The ashes are heated up to even higher temperatures until the ashes have become crystallized. Then the crystallized remains are shaped and molded into beads. These beads vary in color and density depending on the person being cremated. The amount of beads created depends on the age of the person. A young person with dense bones could create almost 5 cups of beads. The colors could be anywhere from green, blue, pink, grey and black. There are a multitude of different beliefs about Cremation. As the time grinds away at people and life itself, beliefs on cremation change throughout religions. Judaism seems to be the exception. Throughout the ages, Jewish people seem to consistently disapprove of cremation. In ancient times, the majority of Jewish people made their strong opposition for the practice very clear. They believed cremation was a pagan practice and was condemned by Jehovah. In the Jewish bible, it is forbidden to further mutilate a body or corpse. Cremation was seen as mutilation. While natural processes do further decompose the body, cremation was seen as an intentional mutilation for purposely decomposing the body. Cremation also made a very hugely negative impact on the Jewish culture in the 1940’s. During the Holocaust, there were at least 6 million Jewish people who perished in concentration camps. A majority of those people were cremated. This has forever impacted the Jewish community, leaving a permanently bad taste in their mouths. To this day, cremation is forbidden in Judaism. While there are few Jewish people who practice cremation, most stick to traditional burials because of religious and cultural convictions. Cremation has been around for centuries, existing in various cultures around the world. However, the reasons for practice to vary from place to place. Some used the practice as punishment and some used it to truly lay their loved ones to rest. Buddhists were one of the cultures that have throughout time, practiced cremation as a form of burial for loved ones. While there are some varied beliefs on it throughout the religion, it was practiced without restriction. Buddhists traditionally did not belief in fancied up burial services that were focused on materialistic things. Cremations allowed services to be sweet, simple and solemn. A more common belief held about cremation seen throughout religions was that cremation was against God and hindered the pathway to resurrection. Buddhists believed in resurrection of the soul, not the body. They believed that after death, the soul left the body and went to another form based on the good or bad actions that particular person took part in. So preservation of the current form wasn’t of the utmost importance. For Buddhists, death only brought a pathway into the next chapter. Cremation burned corpses, which allowed the spirit to be freed from the previous form to travel to the next. Buddhists haven’t ever had restrictions on cremation and still currently don’t. Cremation is a freely practiced within this religion. Cremation seems to be the vibration in the water. It stirs up a lot of controversy throughout religions, especially in Christianity. Traditionally, cremation was extremely frowned upon in the Baptist religion. It was seen as an obstruction of the pathway to God and was banned from the church. Christians strongly believe in resurrection after death. It is believed that a traditional burial is the proper way to dispose of the deceased to send them to the Lord for resurrection. The most common argument throughout Christianity is that cremation hinders resurrection, spreading the molecules about and making it harder for God to find. However, as time goes on, natural processes break down the body eventually, turning the body into mineral compounds and ashes. Christians nowadays believe that cremation only speeds up that process. They believe that the Lord is almighty, and he is absolutely capable of resurrecting a body and soul from any substance if he wished to do so. It was until 1997, that the ban on cremation from funeral masses was lifted. Currently, Christians still make their preference for traditional burial methods known. While cremation still remains a source of turbulence for Baptists and Christians, they no longer forbid cremation services from entering the church. Different cultures celebrate occasions uniquely. Some religions celebrate Christmas with loads of gifts while other religions don’t celebrate it at all. It is the same for celebrations of death. Some religions prefer burials in caskets while others believe in cremations. Hindu people have always used cremation as their method for disposal of the deceased. In Hindu history, they had a customary procedure for cremation. A physically fit man in the family would start a traditional fire. Each person going to the funeral would add a piece of wood to the fire to pay his or her respect to the lost life. Hindu people believe in resurrection of the soul, which is why they burned the deceased. When the deceased person was burned, the soul was released from the body, which allowed it to move onto its next form after death. They believed that a certain amount of time would pass before a soul was resurrected. It was thought that burials made the process of resurrection longer than it would if cremation was chosen. To speed up the process of resurrection, people turned to cremation. Hindu people turned Cremation always has been and is currently a very strong part of Hindu culture. You could almost mistake the definition of controversial to be the definition of cremation. Cremation has forever been a source for turbulence throughout its history. For the 20,000 years of its existence, its acceptance wasn’t granted until the 1870’s in America. The traditional cremation process entails burning a body at very high temperatures until all that remains are mineral compounds and ash. These remains look like dust and can be stored in virtually anything or scattered in certain areas. Once we thought the controversy of cremation was over, a new branch of the practice has come about. Liquid cremation has sparked another wave of battle throughout the United States. Liquid cremation, alkaline hydrolysis, is a process of burning a body at high temperatures until the body is reduced to liquid and soft calcium. Alkaline hydrolysis requires the body to be placed into a machine called the Resonator, which is heated to about 180 degrees Celsius and filled with water and potassium hydroxide. Pollutants stored in the body such as mercury are extracted, making an eco-friendly mixture. The bone remains are turned to ash and can be given back to the deceased person’s family. The liquid, greenish-brown mixture is then poured into sewage systems. This process claims to pose no harm to the environment. Alkaline Hydrolysis is claimed to use less energy than cremation. Because mercury is extracted from the remains, it is not released into the atmosphere. It is also environmentally friendly because there is no major consumption of landmass, unlike the usage associated with traditional burials. With alkaline hydrolysis, fewer trees are used up because there is no need for caskets. So what’s the big controversy over something that poses no ecological harm? The issue is a moral, religious and political one. Various religions have only recently accepted traditional cremation. With the new liquid cremation process, a familiar controversy was once again ignited. While the Catholic Church has recently permitted traditional cremation, the idea of liquid cremation is currently absolutely opposed to. The Catholic religion is firm on their belief of resurrection after death. They believe that there is a proper way to dispose of the body because the body is part of that resurrection. Liquefying the body is seen as an extreme disrespect let alone the manner in which the remains are disposed of. Because the bodies are poured down the sewer system, it is seen as a dishonor to their God. God gifted them with life in a uniquely personalized body. Once life has gone, the body should still be honored. Flushing away the remains of a deceased body is seen as the ultimate dishonor. Other religions, such as Christianity and Judaism, strongly disapprove of alkaline hydrolysis. Their opposition for traditional cremation is evident throughout history. This new form of cremation creates no different opinion. Religious convictions aren’t the only issues existing with liquid cremation. Political leaders throughout the nation are skeptical about the practice. The practice itself is very young. The very first bio-cremation occurred in 1998. Because of its young age, some scientists are skeptical of its true potential health risks to the environment. In 2010, California assemblyman Jeff Miller proposed a bill to legalize the practice of liquid cremation. When Miller was confronted questions from scientists that he did not have the answer to, his proposal was removed. The lack of stability in liquid cremation was reflected throughout politics in most states. In Ohio, one man who practiced liquid cremation in his own funeral home became a lone ranger in the practice. Once he, Jeff Edwards, hit his 19 performance of the practice, Ohio lawmakers began to question the morality of it. They soon quit issuing permits for the practice. This type of questioning began to occur in states around the nation from Nevada to New Hampshire. Lawmakers and citizens were all skeptical of alkaline hydrolysis. However, this didn’t stop the battle for legality. In 2011, California’s Jeff Miller, after meeting with various scientists and water quality officials, redirected his proposal addressing safety concerns and other scientific questions he couldn’t answer in his previous proposal. Jeff Edwards, the Ohio funeral home owner, placed a lawsuit against the Ohio Department of Health because of their refusal to issue permits for alkaline hydrolysis. Steps from various persons of importance have taken place to legalize the practice. As have steps been taken to ban the practice altogether. Currently, there are 8 states that have legalized the practice of liquid cremations, not including Ohio or California. There are 19 states currently in anticipation of legislative decisions and 23 states with no legislative activity what so ever. While there are many proactive steps being taken by scientists, politicians and funeral home owners around the nation to legalize the practice of cremation nationwide, there are many others who are battling to ban it entirely. As for now, the possible eco-friendly method for disposal waves in the air, waiting for its moment to land. Cremation currently remains a topic for controversy and may remain so for the next 20,000 years.